A Brutal Kidnapping. A Lost Prince. A Jealous Brother. A War To End All Wars. But blood is not always thicker than water. With Nadira’s life hanging in the balance, Kiln is forced to impersonate Praxis, the crowned Prince of Mars. Can this former slave play the part of the cocky, dominant, alpha male that the men call Praxis The Immortal? Will he discover his brother’s dastardly plans to dominate the universe? Can Zenith be saved from the blood thirsty Boikis and the power hungry Jun-Su? Can a slave become… A Martian King? 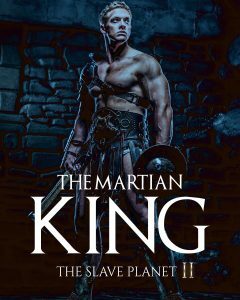 The Martian King is the final book of The Slave Planet series. The Slave Planet takes place on Venus. The Martian King gives us the other side of the coin. It takes place on Mars. Unlike Venus, where everything is regimented and up tight, Mars is a place without rules. It was fun to write and I hope its a fun read as well. The main character in the book, Kiln, is a former slave, so I wanted to come up with a character that balanced him out. Praxis is the exact opposite of Kiln. He's loud, he's cocky, he's dominant. He's a warriors warrior. Praxis was a blast to write. Nadira purred as Kiln placed heated kisses along the column of her throat, his strong hands pulling her closer. She wound her arms around his neck, tilting her head slightly so he could reach the spot where her throat met her shoulder. “Tell me again,” he whispered. The bedroom was dark, lit only by the light that peeked from beneath the drawn curtains, and the soft yellow glow of the metal orbs that slightly protruded from their chests. He moved to the other side of her neck, attending the soft, brown skin there. She ran her hands through his thick blond hair, smoothing it away from his face. He smelled of the Zenithian grass that they’d walked through earlier, a mixture of lavender and his trademark vanilla scented soap. Pulling away from their kiss, Nadira touched her forehead with his. He grinned, the warmth of his smile melting her heart. “Aren’t you going to tell me?” She teased. He pretended to frown, and lifted his lips to hover over hers. He kissed her softly, capturing her scoff with his mouth. She pulled away, her smile wavering. He slid his hand behind her neck, pulling her off the pillow to meet his lips. Suddenly, the door flew open, and two robe covered men ran into the room. Before she could speak, they raised a weapon, aimed it at Kiln, and pulled the trigger. She watched in horror as a dripping needle violently pierced Kiln’s neck. He made a strangled sound, grabbed at his throat, and fell from atop her, collapsing onto the bed where his body twisted and convulsed. His wide, blue eyes searched the darkness for her. “Kiln!” She threw herself on top of him, pulled the needle from his neck and hurled it across the room. Her pulse banged in her ears, her hands shook as she pushed the hair out of her lover’s eyes. His eyes looked glazed, far away. He was fading. The only man she’d ever loved was fading. Two hands grabbed her legs, flipped her onto her back, and hoisted her onto a robed shoulder. He reached for her, fire briefly flickering in his palm before extinguishing in a slip of twirling smoke. For a moment, she imagined that his great strength would overcome the poison that pumped through his veins, dousing the fire that heated his core. Instead, his large hand dropped and his head rolled back onto the pillow. The bed that they had so passionately shared only moments ago now held his limp form, still powerful, but without the pulse of life that so enraptured her. The wail started in her gut, and rose into her throat before she realized it, before she had time to understand the magnitude of what her treacherous eyes showed her. A moment before the scream passed her lips, a dirty hand covered her mouth, preventing its release. Kiln was no longer there to protect her. She was exposed and at the mercy of the men who dragged her beloved from the bed – their bed – and dumped him onto the floor as if he were nothing more than trash. Her mind struggled to wrap itself around what was happening. Kiln had been by her side since they were children. She couldn’t remember a world without him in it. And now, he was gone. Her heart imploded, bursting from the misery, the horror, the absolute sadness of Kiln’s passing. Her lungs no longer pumped air to her miserable body. The room began to tilt. Mother Goddess, take me too. Don’t let him be alone. Take me too! In the darkness, she could only make out his heavy robe and matching cap. “I’m always careful,” his companion snapped, his voice a low, lethal rumble in the room. The pain that clouded her mind began to clear. Careful. That means Kiln’s alive. They’re taking him alive! As if resurrected by the news, her lungs took in a breath. Her heart pumped wildly. Kiln was alive. There was hope. There was a reason to live another day. She pushed against the kidnapper with her knees, squirmed to release herself from his grip, but he was too strong, and held her fast. Her mind raced, trying to come up with a way out of this room, a way to raise the alarm, to save them both. Her attention quickly focused on the blue jewel that sat in the middle of her chest. The jewel that gave her instant control of a planet’s atmosphere. The jewel that was now her only means of salvation. Looking to the ceiling, she focused on the unseen clouds above. In her mind’s eye, she saw a storm cloud form, black and grim. A brief roll of thunder shook the room, before lightning split the sky and shattered the far window, the spraying glass only slightly muted by the heavy curtains. Nadira’s hands rose to block her face from the assault. The man holding her gasped and stepped back. “Stick her already!” His companion commanded. As quickly as the words were said, she felt a poignant stab in her rear end. Hot liquid hastily moved through her hips, back, and shoulders, paralyzing her as it went. When it reached her chest, she felt it surround her toma, cutting her off from its power. She tried to focus on the sky again, tried to call something, anything to her. But her toma – like her beloved – was unresponsive. Forcing down the panic that threatened to rise within her, she tried to focus, tried to take a mental picture of the man who held her, unsure if she would be alive long enough to make use of it. She could only make out his long, navy blue robe, long toed bare feet, and his beard that tickled her. He smelled like sulfur and smoke. “Put her down and help me put him in the bag,” the companion said. The liquid reached Nadira’s head, clouding her mind. As Nadira’s eyes closed, one thought permeated her fading consciousness.